Print-Inspired Art: All The News That's Fit To Paint Newsprint is both the medium and the message in the "Shock of the News" exhibit currently on display at the National Gallery of Art in Washington, D.C. The show examines a century's worth of interaction between artists and the journals of their day. 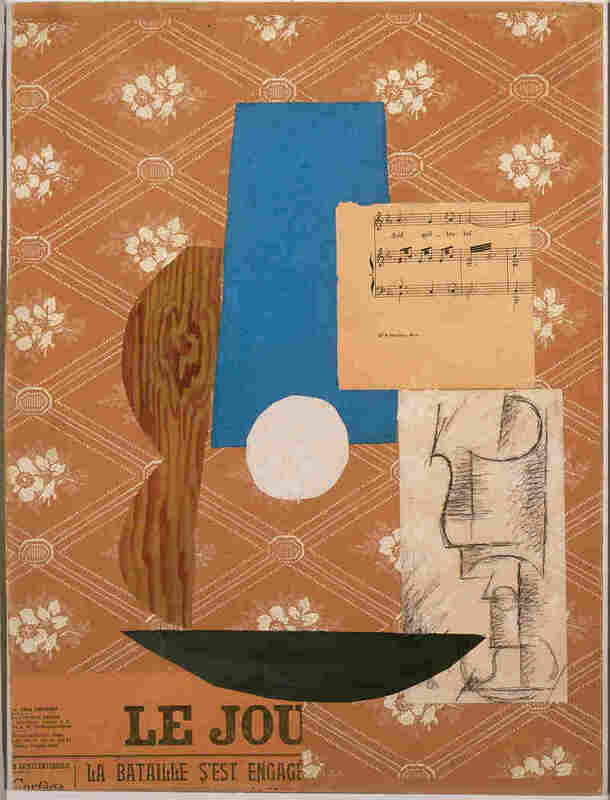 In his 1912 collage Guitar, Sheet Music, and Glass, Pablo Picasso included a fragment of the French paper Le Journal. A 3-foot high, three-dimensional work in one gallery looks like geometric sculpture. The big white rectangle sits on the floor, squared off at the edges. It looks solid — like a piece of marble — but it's actually paper: A stack of mostly blank pages that look like newsprint, waiting to become newspapers. In the center of each sheet, a tiny, printed excerpt from The New York Times. The sheets are layered one on top of the other. Not only are visitors allowed to touch this untitled 1991 work by Felix Gonzalez-Torres, but they can even take a piece of it with them! (Yes it's OK. Museum guards have been informed.) Curator Judith Brodie explains that Gonzalez-Torres wanted to disseminate art the way a newspaper disseminates information. The National Gallery got 9,000 sheets of big paper, so the stack can keep being replenished as visitors walk off with the artwork. Marine Hugonnier's 2005 work, Art for Modern Architecture (Homage to Ellsworth Kelly), makes a collage of a week's worth of front pages and cutouts from an art book. In The Good News, Jim Hodges covers the Aug. 6, 2008, edition of a newspaper published in Amman, Jordan, in 24-carat gold. But visitors cannot walk off with other pieces in the exhibit — like Picasso's 1912 collage, Guitar, Sheet Music, and Glass. It is the first time Picasso uses a piece of actual newspaper in a work. A fragment of the French paper Le Journal is pasted in the lower left corner of the piece. Picasso anatomizes the guitar, in his Cubist way — cutting up its shape so we see it from different angles. In addition to that ordinary strip of newspaper, he's also cut and pasted pieces of sheet music, wallpaper and a pencil drawing of a drinking glass onto his canvas. "This is revolutionary," says Brodie. "Instead of painstakingly representing the newspaper, he uses the real thing. It's a very simple idea, but it's a big one." American artist Jim Hodges has spent much of his career making art with papers. 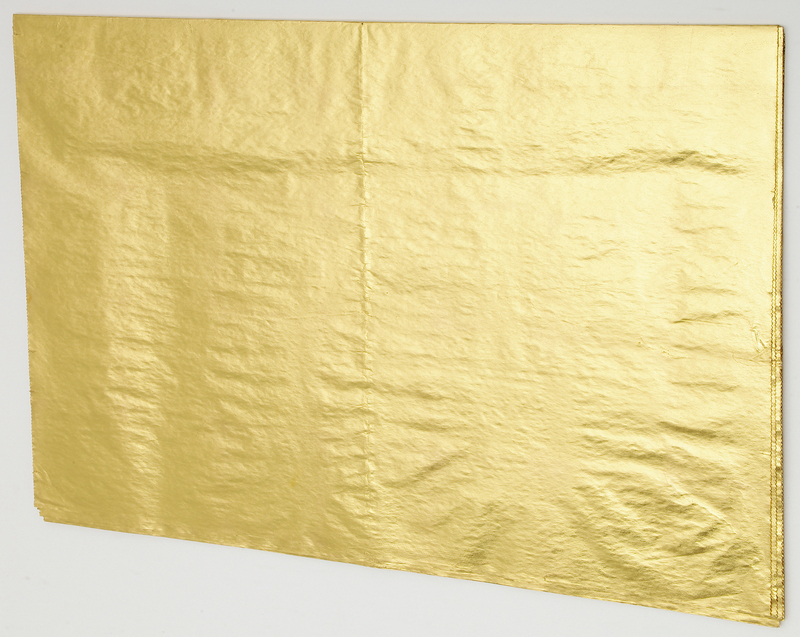 A 2008 work called The Good News uses an edition published in Amman, Jordan — and every single page has been gilded with 24-carat gold. Another Arabic paper — the Palestinian Al-Ayyam -- is French artist Marine Hugonnier's canvas. Side by side, she arranges a week's worth of front pages from November 2004, and creates a collage with colorful cutouts from an art book. The result is graceful Arabic script bedecked with blocks of primary colors. The color blocks are pasted over whatever photographs appeared in that day's paper. There are many reasons artists have been attracted to newspapers, says Brodie. "It's readily available, it's cheap." And there's that ephemeral quality that "today it's news, and then the next day it's history." 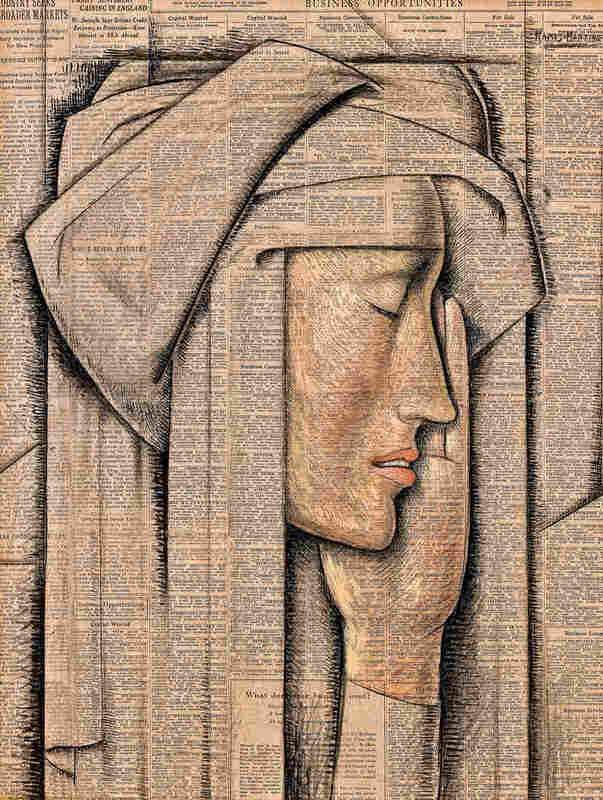 Alfredo Ramos Martinez painted Head of a Nun, tempera on newspaper, in 1934. 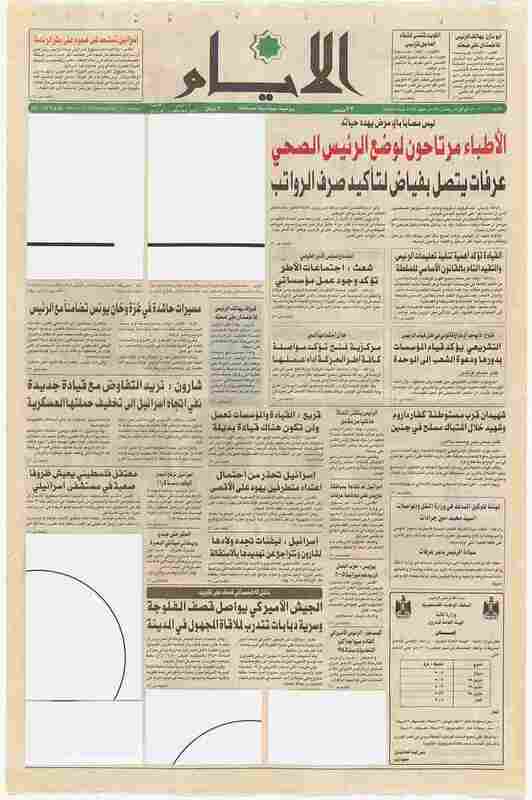 Visually, newspapers give artists a lot to play with. A paper offers a diversity of typefaces and fonts, which Brodie calls a "typographical grab bag." With its columns and margins, it's handsome, and it has an attractive, tactile quality. Brodie says that in the past 10 years, more and more artists have incorporated newspapers in their work — some out of nostalgia, or in homage or commemoration. Over the decades, others have gone beyond design, to make political statements with papers. 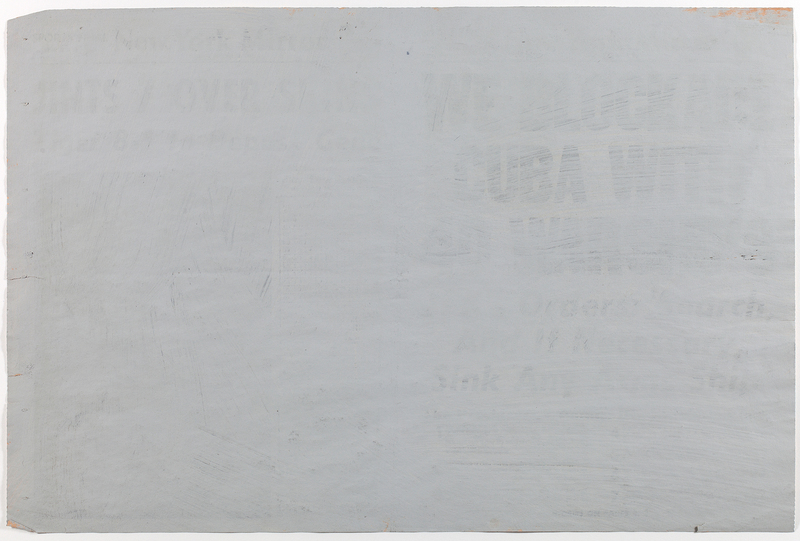 In 1962, during the Cuban missile crisis, conceptual artist Robert Morris protested Cold War politics in a piece called Crisis (Act of War: Cuba). Morris took Page One of the New York Mirror. "He's just covered it ... in a very haphazard fashion with gray paint. It looks like a big cloud. It's been painted to obliterate the paper itself," Brodie says. But when you look closely — click here to see the work — a large headline begins to emerge: "We Blockade Cuba With 40 Warships." "By drowning the paper in gray paint, he was rejecting all that was going on in the political world at that time," Brodie says. 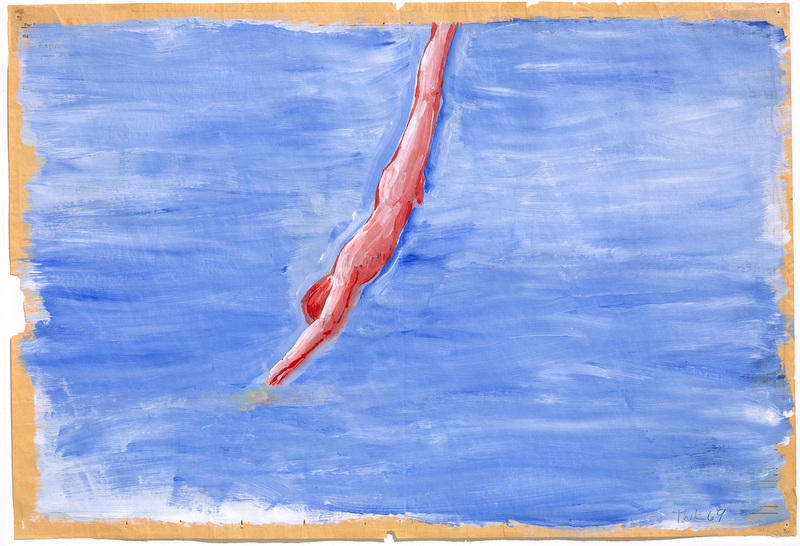 Paul Thek, a tough-minded American artist who has sometimes depicted meat and human limbs in his works, goes cheerier in his 1970 acrylic painting Untitled (Diver). Thek's diver is a pink body plunging into a body of blue water. He uses newspaper as his canvas. In his 1970 work Untitled (Diver), Paul Thek uses acrylic on newspaper. The newspaper buckles under the paint, making waves beneath the diver. "He almost always covers the whole of the content," Brodie says. "You just have brown edges on the side and that sort of ragged edge that tells us it's a newspaper." When you put paint on newspaper it buckles, a technique Thek uses to great effect. The painted paper makes waves beneath the diver. It's entirely possible that 100 years from now, the only evidence left of newspapers will be found in display cases at the Newseum (a museum of news in Washington, D.C.) or on the walls and floors of art museums. That is, unless you go to the "Shock of the News" exhibit at the National Gallery, and walk off with a big sheet of paper from that untitled Felix Gonzalez-Torres — and bequeath it to your descendants.